Review of Bell Mountain, by Lee Duigon. I will admit that as an adult, I still enjoy reading young adult fiction—I even studied it as part of my writing major in college. Whether you like to read young adult books yourself, or pass them along to a young person in your life, I can sincerely recommend Bell Mountain as one book that should not be missed. Jack’s dreams have been haunted by the legendary Bell Mountain—a place shrouded in both mystery, and a thick ring of clouds that obscure its peak from view. But Jack isn’t the only one who has been dreaming about the mountain, or wondering what the dreams might mean. Some said that there was an ancient bell on top of the mountain that could bring the whole world to an end if it was struck, but others disagreed there could be any such bell. Tormented by his persistent dreams, Jack was determined to find out for himself. He and an equally determined young girl named Ellayne, set out on the journey together. And though their purpose was to solve the mystery of Bell Mountain, in the end what they found went deeper, and spread farther, than they could have ever imagined. There is a fairy tale quality to Bell Mountain that instantly captured my interest. Right from the first page, I settled in comfortably, ready to enjoy an adventurous tale as seen through the eyes of a young boy named Jack. It is told in a time-honored style that is familiar to all those who love both children’s fantasy and fairy tales. There are plenty of fantastical creatures to spark your imagination. Some are benevolent, like the small, hairy animal named Wytt who befriends the children. Others are terrifying, like giant birds that attack horses and eat them for supper. Peril and excitement abound in this unique story unlike anything else I have found. As a youth, this would have been a favorite book that I went back to read again and again. As an adult, it makes me feel like a kid again, sneaking off with a new book fresh from the library to get lost in world very different from my own. 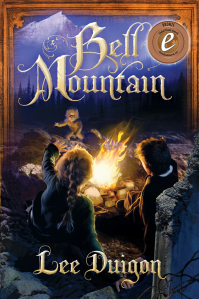 Best of all, Bell Mountain is not just an ordinary story. It has a strong Biblical foundation that introduces some of the basic concepts of Christianity in an easy to understand, non-threatening way. I anticipate that as the series continues, the children’s faith will continue to grow and mature, becoming an increasingly important part of their lives and the lives of those around them. I look forward to picking up the second book, The Cellar Beneath the Cellar, to find out what is in store next for Jack and Ellayne. Lee Duigon wrangled this interview with Fnaa, a supporting character in his Bell Mountain series. Fnaa is only ten years old when he first appears in The Fugitive Prince, so Lee asks that we cut him some slack. Q: Fnaa, mostly what you do is impersonate King Ryons. In fact, you’re a dead ringer for him–even I can hardly tell the two of you apart. Fnaa: Well, you should learn how. We don’t want to get stuck because you forgot who’s who. Q: What’s it like to have a whole city full of people thinking you’re the king–when you aren’t? [long pause] Do you want to stop fidgeting and answer my question? Fnaa: The little girl who’s a prophet or something, she said I could do it. She said God wouldn’t mind. Q: But all those people cheering you–isn’t it kind of overwhelming? Fnaa: [Rude noise] I know what it means! It’s fun to take the tax money and throw it back to the people on the street. They really go for that! And it’s fun to call those high-and-mighty big shots names like ‘Fatty’ and ‘Baldy.’ Yes, I love all that–but it’s not like I want to do it all the time. Let King Ryons be king for a while. Q: Didn’t you feel a bit guilty, allowing that good man, Prester Jod, to go on thinking you were King Ryons? Fnaa: I’ve got to go now. Is Star Wars Written for the Fans?